Experience the TV show Ghost Adventures in real life as you hunt for ghosts in the real-life abandoned mining town of Goodsprings, Nevada near Las Vegas. It’s a spine-chilling evening filled with thrills and ghost stories that’s sure to deliver a spooky good time. Start your trip in the evening with a 35-minute drive (approx. 25 miles (40 kilometers)) outside of town to Goodsprings a former mining city that today lies abandoned. During your drive you'll watch a short video about what you'll experience during your tour. 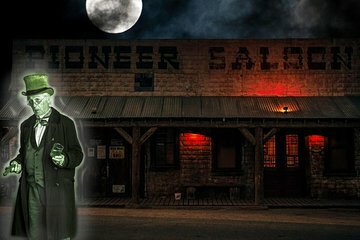 When you reach town, first fuel up for your ghost-hunting with dinner at the Pioneer Saloon (who wants to hunt for spirits on an empty stomach?). Then grab some ghost-hunting equipment as you follow your guide on a hunt by foot for evidence of the paranormal phenomenon reported to be found in town. You’ll follow your guide into dark, desolate abandoned buildings in search of some of the ghosts that call Goodsprings home. As you walk, you’ll hear tales from your guide about the various ghosts that haunt town, and theories about why they persist to this day. Head inside the town’s famous Pioneer Saloon and Gallery, more than 100 years old, which is said to be haunted by a gun shot victim and a miner. Hear about the various sightings of these two specters by visitors and employees alike, and then do some investigation of your own using your included ghost-hunting equipment. 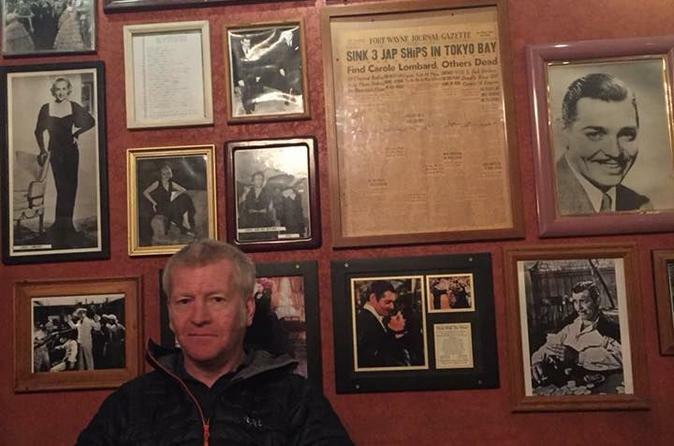 Learn the history of the town, see bullet holes left in the wall of the saloon from gambling shoot-outs and listen to stories about how Clark Gable waited there for three days to learn the fate of Carol Lombard in the crash that took her life. At the conclusion of your excursion, you’ll return to Las Vegas. Please note: This tour will involve walking through uneven terrains (deserted and destroyed buildings and a cemetery). Please wear close toe shoes as sandals and open toe shoes are not permitted for your safety. Please also be sure to wear warm clothing in winter months as it will be cold most nights. Our guide was good....and we had a lot of activity. I have done this before, and have never been disappointed. The only difference is that I had to go to a different hotel to meet the guide and others instead of being picked up where I was staying. The group on the tour were very nice and we all experienced ...ghosts... I was raised in Las Vegas but work for the government in DC, I get home a few times a year....and the Pioneer Saloon is a special stop. For star gazing, ghost hunting....or just a good steak dinner. Don't miss the Pioneer Saloon. This ghost hunt was great, the guide knew his history which added to the tour. It is an experience....you shouldn't miss. We were lucky enough to be the only people to turn up other parties loss, met David our guide. Drove out to Goodsprings but we received a commentary on the way and watched programme. We were given our bag of goodies to use for the evening and had our food. Walked around David giving us lots of information, lots of events for such a small place. Really enjoyed the evening would definitely recommend the tour. The tour was given by a very knowledgeable guide, EVPs were heard through an electronic device, and paranormal photos taken. There are orbs hovering above the persons in this photo. My wife and I were the only people on the tour and we had an amazing time with our guide, David. He was very informative and entertaining. Goodsprings is a fascinating place and very eerie at night. The ghost hunting equipment was great and we experienced paranormal activity both around the town and inside the Pioneer Saloon. Also, the food at the Pioneer Saloon is amazing! Loved the ghost hunt in Goodsprings, David our tour guide was great and very knowledgeable. We saw and heard things that we cant explain the whole night was very enjoyable and had some great food too. Great Experience. We had an amazing time and David and JB were awesome guides and knew the history. My husband and I were the only two people on the tour and it would perhaps have been more fun in a group. But the guides were good, amusing and well informed. Our included meal was marred by the fact that as we were the only two there we had to sit eating whilst they talked us through the equipment which was a little uncomfortable. Fun eventing THE saloon was super.